Isaiah Zagar’s mural on South Street, Philadelphia. 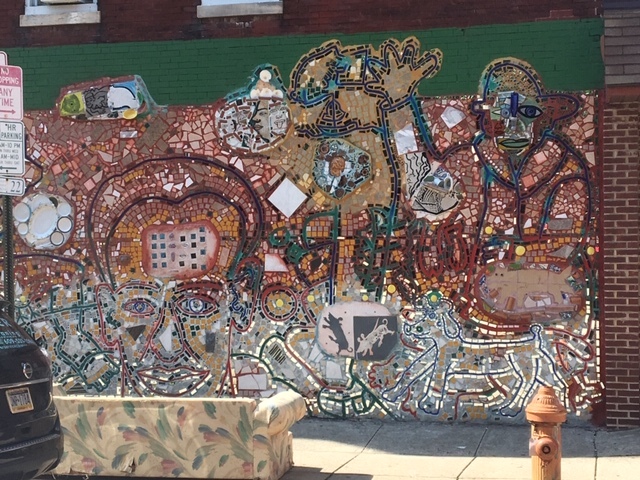 No trip to Philadelphia would be complete without viewing at least a dozen murals done in ceramic, mirrors and found objects by Isaiah Zagar. We had one on the front wall of our garden at our home of 30 years on South 2nd Street. 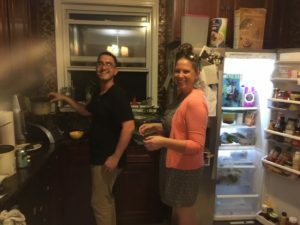 I took a red eye flight from Portland to Los Angeles and then on to Philadelphia so just needed to rest the first day at my younger son, Zack’s house in South Philly. Then met with all three kids for dinner in town and on to my daughter Dorsche’s new home in Wyncote, PA which is near Chestnut Hill. 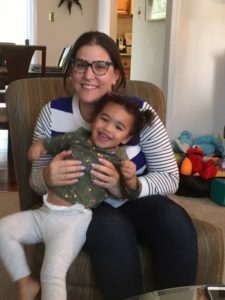 We visited with her best friend, Lindsay Roberts and daughter Simone who is almost 2 years old going on 15. The other day she asked her mother who Brett Kavanaugh was! 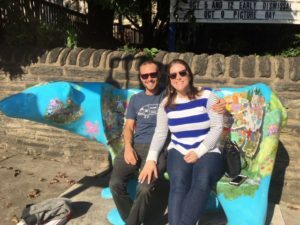 Dorsche and her husband Dave Krevitz on a polar bear bench in Chestnut Hill. I took the train back into Philadelphia Sunday afternoon in order to stay with my older son Max’s dog while he is traveling with friends in Portugal and Spain. Zack lives just a few block from him so I have been treated to home cooking there. Last night was Chick Pea and Carrot Falafels with lots of beer. I came home to find the refrigerator wide open and emptied by Max’s dog, Hunter. 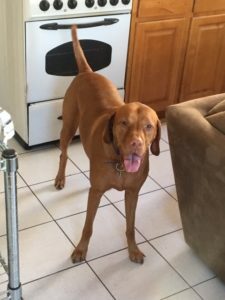 He ate 5 pita breads, half a dozen chocolate chip cookies, half a pound of turkey breast, a package of sharp cheese and several slices of rye bread! I screamed and ranted at him but he just gave me a silly look and curled up on the foot of my bed. My son Zack Pinsky and his fiancé Claire Norwood. So this is life so far in Philadelphia. Home next week to Mexico with plans to build another library this month. I have been gathering Spanish language children’s books in my travels with funds provided by my Uncle Chuck and now just need to get them back home.